I’m afraid… I’m very afraid. You see? This is why I decided to do all my Black Friday shopping FROM HOME. I can’t get into the madness that is Black Friday. Yes, you do get great deals… but you better believe I don’t want them THIS BAD. 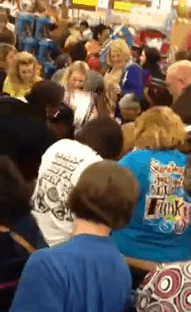 Check out the video of a group of Black Friday shoppers going CRAZY over $2 waffle makers. Not your cup of tea either? Check out my online sale finds here. Absolutely crazy!! I stayed home and shopped online. The deals were still great. There was only one that I couldn’t do online and it was something for me and not a gift anyway. Ok, did I see buttcrack in the chaos? Wow. That is just sad, and seriously insane. This is just SERIOUSLY wrong.